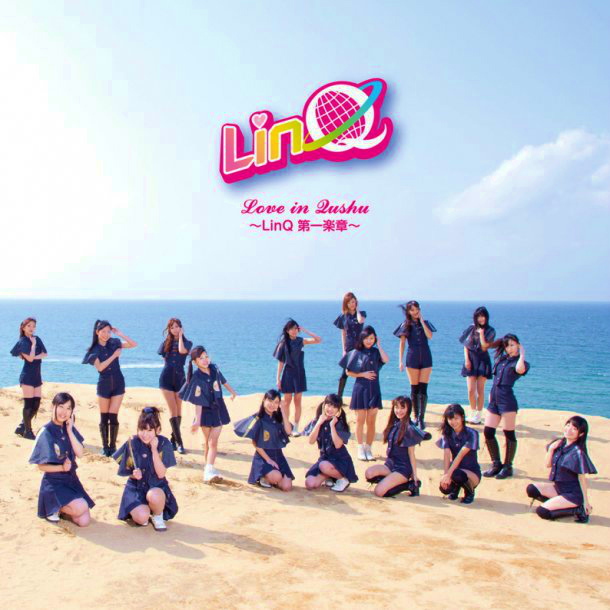 When asking for Review Monday requests, one of my friends suggested her favorite idol group’s first album, which is LinQ’s Love in Qushu ~ LinQ Daiichi Gakushou~. LinQ is one of the many groups I really feel like I should be a bigger fan of. They are from Fukuoka, which is home to many groups I enjoy, including my second favorite idol group Rev.from DVL. So I’m excited to do this review of a group that I, to be honest, don’t know as much about as I should. 1. LinQ Theme – I’m a sucker for a good instrumental theme at the start of an album, so this is a pretty good start. It’s a nice guitar-heavy opening with some spoken announcements, like an overture. Is it an overture? I could honestly imagine this played at the beginning of a concert. This isn’t necessarily something that pumps you up quite as much as, say, the AKB48 overture or the Momoiro Clover Z overture, but I could imagine with some wota chants that this could be a really great overture for LinQ. Except this is something I’d be more inclined to listen to on its own, as opposed to the AKB48 overture. Again, not sure of how often this is used, but I enjoy this so far! 2. Hajimemashite – The theme leads right into this, which is something I enjoy a lot in an album. One of the things that I feel that idol albums do wrong on a fairly regular basis is not thinking about their albums. Rather, they don’t place importance in where songs go on the album, but it’s just a collection of singles and new songs. Having one thing lead into another goes a long way into making the album feel cohesive. That, and this first full song (and their first single) is called “hajimemashite” which is something you say to someone when you first meet them. So this goes a long way to making this a good album, as opposed to a good collection of songs, to me. That said, this isn’t the only thing I enjoy about this song. This whole song is fantastic. It’s funky and fun. The funky instrumentation (especially the keyboard and electric guitar parts!) are excellent; the arrangement is all-around well done. For being a first indie single, the production values are very high. The vocals aren’t necessarily the most remarkable, but they’re better than a lot of idol voices. 3. for you – from the title I expected a slow ballad. Nope, it’s a high energy song with a lot of guitar. Of course. Not that I mind. This is immediately a lot less memorable than Hajimemashite. Which isn’t a terrible thing; Hajimemashite was so good that a little step down is expected. The melody does a couple of things that I personally wouldn’t choose, and the instrumentation isn’t quite as good as Hajimemashite’s was (though the high points is when there’s some guitar). The one thing that really holds this song back, though, is the production and sound mixing. There’s a strange amount of reverb used in this song, especially on the vocals in the chorus. A little reverb isn’t a bad thing, but this makes the entire song sound busy (with so much stuff lasting so long) and makes the vocals sound strange. I looked this song up on Youtube earlier and the short version I found had much less reverb. So is this a remix/rearrangement for the album? While I’m usually a sucker for strings, the instrumentation again shines when it focuses on the electric guitar. If it brought in more guitar and more strings I would be a happy camper. My big complaint for this song is the length. It clocks in at a fairly long 5:30, which I’m not immediately opposed to. However, some of the verses drag a bit. If they had just cut thirty seconds and trimmed up the early verses (because everything after 3 minutes is good and the chorus is all great) this would be a much improved song. That said, I really enjoy the choruses and I think this will be a song I’ll end up listening to a lot. Despite my small pacing concerns, this song is quite enjoyable to listen to and you know I love some good funky music. The song has grown on me a lot, and I have a feeling this will end up being a favorite of mine. 8/10. 5. Natsu Magic – Another funky sounding song! LinQ, are you trying to kill me in a good way? This is a lot more laid back than the past few songs, with a much slower instrumentation. In general it sounds a lot cuter, as well, though that mostly comes from the arrangement. At first, I was going to complain about Natsu Magic dragging, but after a few listens I no longer think that’s the case. It’s slow, sure, but it’s more of a mellow, slow jam that you listen to while doing other things. Personally, I tend to favor faster paced songs. I like a good ballad now and then, but I find myself to be more forgiving of fast, hyper songs. I rarely listen to slower songs, and even rarer are these types of slow jams. However, I find myself liking this song more and more by every listen. 6. Fighting Girl – Oh hey rock-inspired song! Good to hear you! I really enjoy this song; it’s got some excellent vocals, and is an upbeat, fun rock song. The vocals and melody remind me a bit of Roam by the B-52s, in a good way. Too often when idol music brings in rock it’s to be heavy or serious; this shows the potential of that instrumentation and attitude to be upbeat and happy. This is the type of music I wish idol music would use. 7. Pretty Woman – No, not the Julia Roberts movie. Although, I’m sorry, this is the type of song title where I will never be able to separate it from the preconceived connotations in my head. I have no idea how well known Pretty Woman, the movie, is in Japan, but it’s well known to me, so. The synth sound at the beginning of this song sounds pretty 90s. In fact, this song sounds like it wouldn’t be out of place in the late 80s/early 90s. This is a pretty solid synth-tastic mid-tempo song. It’s laid-back despite all the synth that gets in there. Some of the instrumentation is a bit too precious for the song, with what sounds like light chimes. It isn’t a very varied song; what you hear in the first five seconds is pretty much what you get. That said, it’s nice. It’s not a bad song, but it’s not the most interesting song. It’s nice to listen to, and it definitely grows on you. 7/10. 8. Kimochi – Autotune! LinQ’s going for some Perfume in here. This song is slow and a slow jam in a way I might not like it. But something about this song is very compelling. Maybe it’s the rapping, maybe it’s the autotune, maybe it’s the saxophone solo. Just something about this, combining some Perfume with early Morning Musume, makes me love this. The entire instrumentation is fantastic; this is very heavy on piano and percussion, but that saxophone solo surprised and interested me. I also really like how this instrumentation goes with the autotuned vocals; it’s something you might not think would go that well together, but it sounds really great. 9. Sakura Kajitsu – This is the only song I knew previously to reviewing this album. And what a song it is. It’s a big contrast to Kimochi; whereas Kimochi was using the autotuned vocals in a slower song, this is autotuned vocals over a largely electronic instrumental. And it’s done very well. While the noticeably absent Calorie Nante is LinQ’s big single, this is a single that swayed me to paying a bit more attention to LinQ and want to review an album. Just everything about this song is done well. The vocals sound quite nice and they use the effects for some beautiful harmonies that make the vocals almost instrumental. The song doesn’t drag at all, and sounds like a well constructed and paced song. There are no production issues at all, and it in fact sounds beautiful. While this may not convince the most anti-vocal effects/autotune groups, this sounds quite frankly beautiful. 10. Nau – Anything after Sakura Kajitsu is going to be a bit of a letdown. But what a fun letdown Nau is! It also prominently features autotuned vocals, but is now an upbeat, cutesy, almost hyperactive song. While, in my opinion, this doesn’t use those vocal effects quite as well as the previous two songs, it still works here. While this isn’t going to be as memorable as Sakura Kajitsu, by any means, this is just a fast and fun song. If there weren’t such fast parts I imagine this would be a very fun song to sing along to or sing at karaoke. There is no real depth in the instrumentation or production; this is just pure fun. Which is great sometimes. And it’s great here. 8/10. 11. Shining Star – The last song on the album (unless you listen to the version with a bonus track which I don’t have). And what a way to end. While the past few songs have been heavily autotuned and fell on the side of being cutesy, this is feels like a happy medium between the cute and mature parts of this album. There are certainly cute parts of this song, but it’s also guitar heavy and features some mature vocals. Overall: As someone who didn’t follow much of LinQ at all before this, I’m surprised at just how much I ended up loving this album. Often funky, often very well produced, this is a very solid first effort that uses a lot of elements that I’m a sucker for. I think I have to be a LinQ fan now.